The Cedar Point amusement park consistently is rated as one of America's favorite theme venues. The 364-acre park, located just outside of Sandusky about a 1 1/2 hour drive from downtown Cleveland, is home to 18 roller coasters, a white sand beach, a classic merry-go-round, four children's areas, a plethora of shops, food stands, and tons of exciting rides. Cedar Point opens the first weekend of May and stays open on weekends through Halloween. Tickets are $72.00 for general admission and available from Cedar Point online, by mail, phone, or in person at the attraction's onsite ticket office. However, to avoid paying the full price, several discounts are available, both from the park itself and from other area retailers. For most people, the best price at Cedar Point is the online, discounted price. Prices vary depending on when you visit and options you choose, but you'll save an average of $20.00 over the gate price by ordering online. The Cedar Point ticketing website regularly updates with seasonal offers. Guest can save some money by skipping a daytime visit and heading to the park in the evening. Cedar Point often offers starlight discounts for those entering after 4 p.m. that will take a few dollars off general admission. Weekdays should be a little cheaper than weekends. If you plan to visit Cedar Point more than once this season, save money by purchasing a season pass. Passes for 2018/2019 start at $139.00 per adult and the park offers a payment plan spread out over eight installments. There is also a platinum season pass for $200.00 that includes unlimited admission to Soak City, free parking, and early ride times. The platinum pass also provides entry to other Cedar Fair parks, like ​King's Island near Cincinnati. There is an additional discount if you're renewing your season pass. Applicable taxes and service charges fees. Cedar Point offers a discount to active, retired, or honorably discharged military personnel and immediate family members. You can purchase up to six tickets per military member. Passes may be purchased online, but a proper ID is required to validate. The park has also offered free admission over the Memorial Day weekend as part of Cedar Point Salutes America’s Armed Forces. 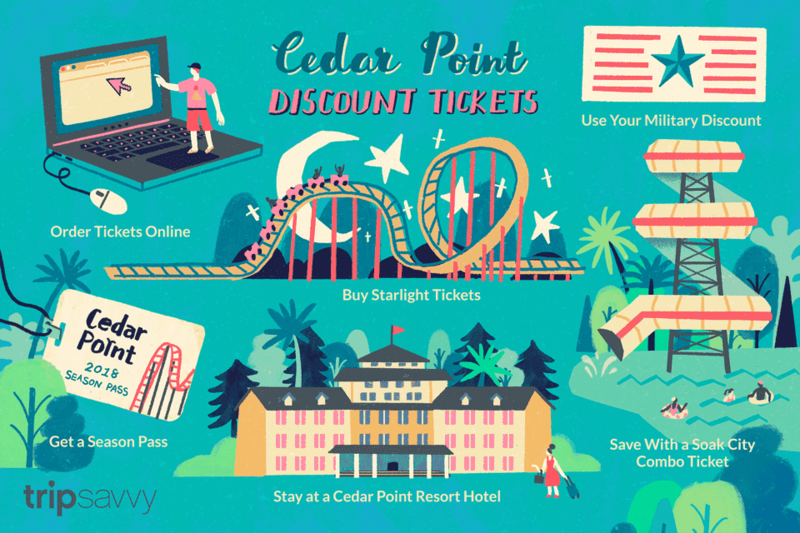 Guests of Cedar Point's resort hotels (the Hotel Breakers, Lighthouse Point, Breakers Express, and Castaway Bay Resort) are eligible for a substantial discount on daily park admission or special stay packages that include park tickets. Resort guests also get early entry (one hour before opening) to the park. A good deal is purchasing a combo ticket that provides admission to Cedar Point and Soak City for two days. Tickets start at $74.99, and a second-day entry can be added for an additional $29.99. Historically, northeast Ohio AAA offices have offered its members discounts on general admission Cedar Point admission tickets. Tickets can be ordered online via the Ohio AAA website. Meijers, the large central Ohio discount retailer, offers discount tickets to Cedar Point, Kings Island, and other area attractions seasonally. There are no Meijers stores in the greater Cleveland area, with the nearest store to the city in Mansfield. Select Meijer stores also sell Regular and Platinum Season Passes, as well as Park Combo Tickets for Cedar Point and Michigan's Adventure. The Ohio Department of Tourism, via the Discover Ohio website and toll-free number, offers free Ohio visitors guides each year. Inside these guides are several pages of coupons for attractions in the Buckeye state. Among these is a coupon good for a discount off of regular adult Cedar Point admission. The Cleveland Plain Dealer and other area newspapers have historically included Cedar Point discount coupons in the Sunday inserts. Mark your calendar as these coupons generally appear at the beginning and toward the end of the season.